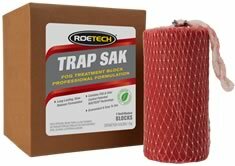 ROETECH Trap Sak is a highly concentrated water dissolvable matrix infused with the patented ROETECH FOG and odor controltechnology. This material is designed to slowly and constantly deliver powerful bacterial cultures to your high flow waste water systems where once-daily applications of other products are not enough to maintain proper biological activity. TS is a safe, non-corrosive, non-enzymatic technology which can effectively degrade food residues, FOG, and other BOD laden materials and controls odors from hydrogen sulfide and other organic fatty acids. ROETECH TS can be hung in grease traps, drain lines, clean outs, pump pits, lift stations, or in almost any part of a waste water collection system.